Dr. G. Ramprabu has completed U.G. – B.E. (Electronics and Communication Engineering), P.G. – M.E. (Applied Electronics) in Anna University and he has completed Ph.D. (Electronics and Communication Engineering) in Hindustan University. He has published 8 books for various university syllabuses and has published various papers in National and International Conferences, Journals. He is a Life member of ISTE, Fellow of ISRD and Member of IAENG. 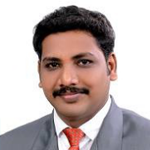 He is currently working as Director, Research at a college affiliated to Anna University in Tamilnadu, India.